The “Toolbox for Museum School Programs” is a resource to help museums, and similar institutions, develop and deliver successful school programs. This toolbox was created by the Nova Scotia Interpretive Working Group in partnership with the Department of Education and Early Childhood Development as a direct response to the current needs of museums, archives, libraries, cultural institutions and educators in Nova Scotia. Created with Interpreters in Mind. It doesn’t matter if you are new to interpretation or have an entire career in the field, this toolbox has something in it for you. The toolbox can act as an introduction, a personal development tool, a training tool, a resource, or a point of inspiration. This toolbox was created to support the 28 Nova Scotia Museum (NSM) sites, however museums outside the NSM and other informal education centres, such as archives and libraries, will however also find it useful and are encouraged personalize the information to suit their needs. A box full of ideas. 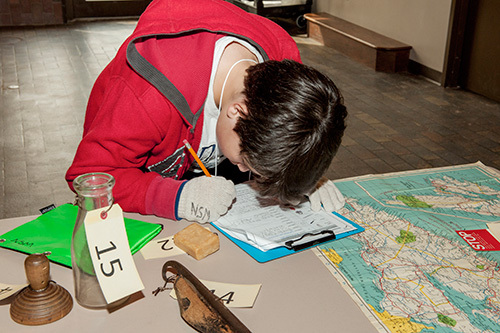 Why Focus on Museum School Programming? Remember that help is always available. Museums are encouraged to work with each other, work with archives and libraries, work with their community, and work with teachers to create experiences that best meet the needs of their local audiences. Additionally, in Nova Scotia, museums can access provincial support through the ICI (Innovation, Collections and Infrastructure) interpretation team, the IWG (Interpretive Working Group), and ANSM (Association of Nova Scotia Museums). Email us with your questions. Use the whole toolbox or any of its parts. Alternatively, the seven modules and nine appendices of the toolbox, along with several Word document templates, can be downloaded as individual sections.